Mohkhu, working on a door. 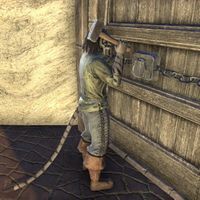 Mohkhu is a Khajiit laborer who can be found on the Canton of St. Olms the Just in Vivec City. He has no unique dialogue. This page was last modified on 3 October 2017, at 18:28.